Born in Britain in 1960, James Orbinski's family moved to Canada when he was seven years old. As a young man, he became a medic to learn how to help, and deal with, the suffering of others. From then on he was plunged into many highly demanding situations, including being Head of Mission for Medecins Sans Frontieres (MSF) during the Rwandan genocide; engaging with the politics of humanitarian work as the President of MSF; being in New York when the twin towers of the World Trade Center fell on September 11; co-founding Dignitas International (an AIDS charity); and finally, returning to Rwanda on the 10th anniversary of the crisis there. 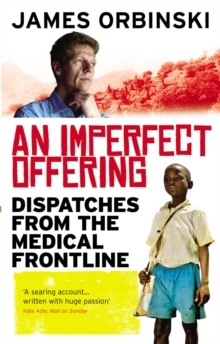 In An Imperfect Offering, Orbinski not only tells his own inspiring story but is also remarkably provocative about what governments and agencies should and shouldn't be doing to help the world's poor and very sick. At the same time, he addresses what part each of us can play, so that we never lose sight of the dignity of those being helped, or deny them the right to act in their own lives. His conclusion is blunt and profound: 'Humanity is lost or saved one person at a time, one intention at a time, and one action at a time.